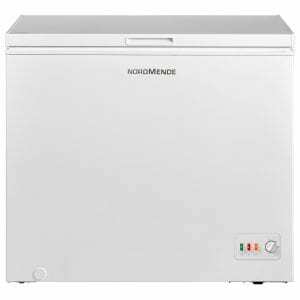 This superb freestanding chest freezer from Nordmende measures 73cm wide and 85cm tall. It has an A+ energy efficiency rating which will ensure your bills and energy usage will remain low. Boasting an impressive total capacity of 142 litres this appliance also has a 4-star freezer rating. There is a fast freeze function and an adjustable thermostat available too. Need to store something bulky? There is a removable storage basket which gives you plenty of flexibility in terms of storage. Suitable for use in an outbuilding, this chest freezer would be ideal for storing larger or lesser used items that you do not need in your kitchen freezer. Perfect for preparing for summer, you can keep your BBQ meat and ice cubes ready for those impromptu parties! 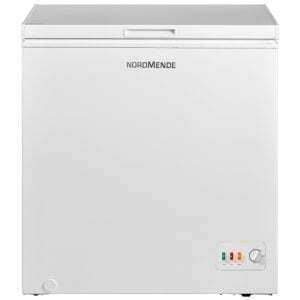 This superb freestanding chest freezer from Nordmende is 95cm wide and 85cm tall. It has an A+ energy efficiency rating and boasts an impressive total capacity of 198 litres. 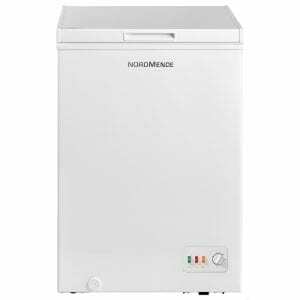 This superb freestanding chest freezer from Nordmende is 57cm wide and 85cm tall. It has an A+ energy efficiency rating and boasts an impressive total capacity of 99 litres.